The new Medved armored vehicle. In Septmeber 2016 Moscow hosted the Army 2016 International Military Forum, which is one of the world's largest armament exhibitions. Besides the traditional tanks and combat airplanes, the Russian delegation amazed the guests with a new type of weapon: the new-generation Medved armored personnel carrier (medved means “bear” in Russian – RBTH). Located at the Voenno-Promyshlennaya Kompaniya stand, the vehicle’s name is no accident. Almost six meters long and two meters wide, the armored vehicle's silhouette can be easily recognized: Its body height is almost three times that of an ordinary light car. Its mass (12 tons) can be compared to that of a light tank. The Medved can hold a crew of up to eight people, excluding the driver. They will be protected by the vehicle’s highly durable armor. The constructors of the “Bear” paid special attention to its armor, whose design features an important contemporary decision: A small amount of air is left between the two layers of metal, which reduces the force of armor-piercing bullets. Additionally, there is the possibility of strengthening the armor in the future. 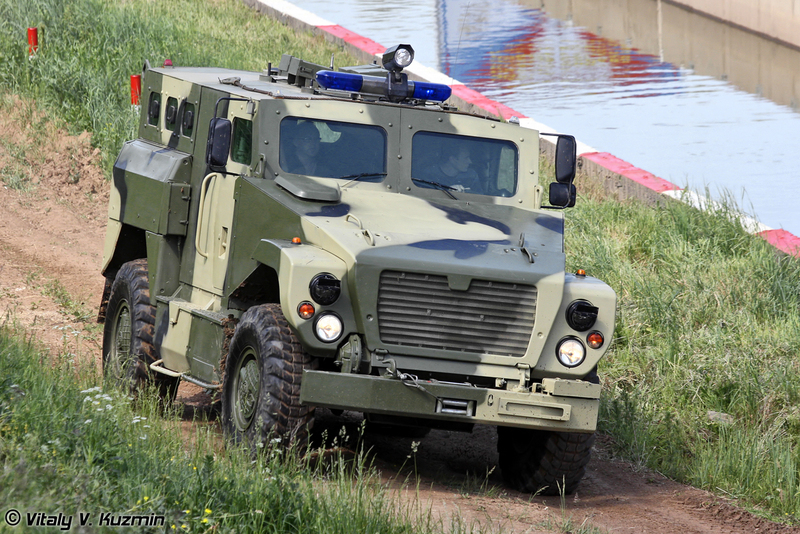 Consequently, today the Medved is one of the most bulletproof armored vehicles in the world: During tests even the glass and the door slots remained intact. The Medved’s armaments practically makes it a universal armored vehicle. Basically, it has no stationary weapons. Depending on the situation, various types of weapons can be mounted on its moveable platform, from mixed-caliber machine guns to anti-tank guided missiles. What we have in the end is not a piece of hardware designed purely for the army or the police, but rather a vehicle that can be used in almost all combat conditions. The necessity of creating a new-generation armored vehicle became clear after the results of battles in hot spots, particularly in the North Caucasus. The old armored vehicles were easily destroyed by mines and possessed very weak weaponry. As a result, tanks had to perform their functions in battles, something that is unpractical and risky. The unsuccessful use of tanks during the assault on Grozny in 1994, among other things, proved that Russia needed to develop a new armored vehicle. When the Medved was being created its developers focused on how to protect it from mines. The special shape of the bottom, high ground clearance and additional armor help the vehicle withstand explosions even from the most powerful mines. During tests at the Defense Ministry firing range a bomb with seven kilograms (15 lbs) of TNT was exploded under the vehicle's wheels. The Medved’s structure withstood the explosion and would have even guaranteed the crew's survival, if it had been inside. But that is not all. The Medved is equipped with special instruments that can incapacitate radio-controlled explosive devices, as well as with a smoke-screen system. This makes the armored carrier a type of module that can protect all nearby vehicles. However, that the Medved’s armor, with all its merits, is still not durable enough to participate in full-fledged combat. Protection from a mine or armor-piercing bullets does not guarantee protection from a grenade launcher. Additional armor is necessary for overcoming this defect, and the Arzamassky Machine Construction Factory, which produces the vehicle, is currently working on this challenge. Yet while these weaknesses have the potential to prevent the Medved’s use on the battlefield, they will not impede the use of the vehicle in other spheres. According to Russian daily Rossiyskaya Gazeta, Russia's Interior Ministry and the recently formed National Guard are showing special interest in the armored vehicle. Anti-terrorist operations may one day require precisely the technical characteristics of the Medved. Moreover, export opportunities are also opening up. During the Army 2016 Exhibition defense ministry delegations from various countries, including Argentina and Niger, showed an interest in Russian armored vehicles.